This weeks recruiting notes comes out a day late as yesterday was a travel day back from the west coast where I was attending a wedding in beautiful San Diego. Enough about myself, lets get on to this weeks notes. 1997 forward Ryan Finnegan is off to a sizzling start since moving over the New Jersey Hitmen Premier team of the USPHL. In 5 games he has 9 points so far (3 goals and 6 assists) which is a 1.8 points per game clip. He was finally held scoreless in New Jersey's 5-0 win on Sunday against the Springfield Pics. Finnegan looks to be getting back on track after struggling in 16 games for Alberni Valley of the BCHL where he had only four assists. Quinnipiac picked up a commitment on October 31st from 1996 forward Matt Forchuk for the fall of 2017. 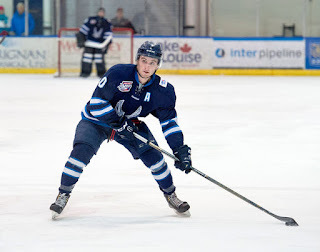 The 5'10, 170 pound forward is leading the Alberta Junior Hockey League in scoring for the Canmore Eagles. In 17 games he has 31 points (11 goals and 20 assists). He has also racked up 50 penalty minutes on the season. He should bring some scoring depth to next years team and plays with an edge. Neutral Zone has rated him a 3.5 star prospect. Neutral Zone @_Neutral_Zone NZ's #37 ranked 1996's (NCAA Eligible) in North America. 3.5 star prospect @11Forchuk of @TheAJHL commits to Quinnipiac for fall of 2017. With 6 points in his last 5 games (5 goals and 1 assist) 1997 forward Matt Creamer is on a hot streak. He has already bested his 2015-16 season in which he had 8 points (6 goals and 2 assists) in 47 games. This season, Creamer already has 13 points (8 goals and 5 assists) in 21 games played and also serves as a alternate captain for the Nanaimo Clippers. 1998 forward Johnny DeRoche is no longer on the Cedar Rapids (USHL) roster after the Rough Riders have gotten off to a brutal 0-11-2 start. It's been reported he has been shipped to the Topeka RoadRunners of the NAHL but is not yet on the roster. He is set to report next week as Topeka was off this week. Regardless, he was off to rough start with Cedar Rapids only recording one assist in 10 games for them after having 14 points (5 goals and 9 assists) in 39 games a season ago for Cedar Rapids. 2002 forward Jacob Quillan had a two point weekend for the Steele Subaru Major Midgets. He also recorded his first goal of the season this past weekend. In 13 games he has 1 goals and 6 assists but is also the youngest player on the team. 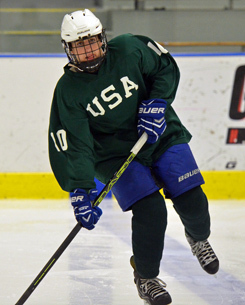 2001 defenseman Nicholas Kent picked up 2 more assists this past weekend and now has 11 assists in 14 games for the Delta Hockey Academy Elite 15's. 1997 Dan Winslow had a highlight reel goal in the USPHL Beantown Fall Classic which took place the last week of October. He came in at number 3 of best goals on the weekend. You can check out the video here.